• UPVC windows with double glazed sealed units..
• Adjustable ventilators to all windows. • CFC-free insulation to hot water cylinder with immersion heater. • Efficient Mitsubishi Ecodan boiler with electronic programmer. • UPVC windows with double glazed sealed units. • Veneered feature front door with glazed panel, panelled or glazed internal doors. 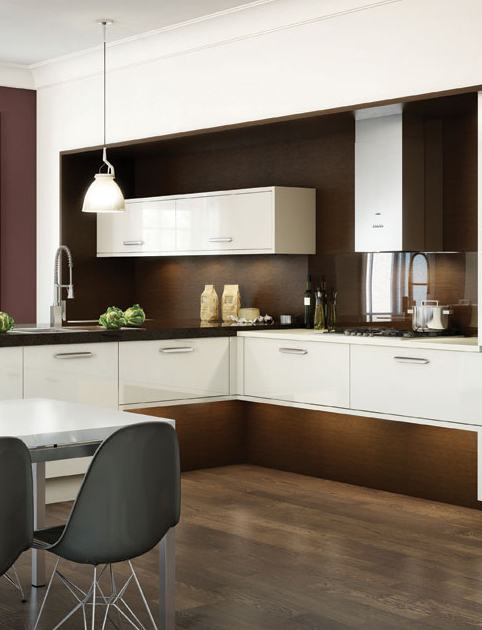 • Multiwood in Homedown white or cream fitted kitchen with chrome handles. Complete with oven, hob, cooker, hood and dishwasher, with space for fridge freezer and washing machine. • Wood flooring throughout kitchen/dining area. • Hansgrohe (or equal) with chrome mixers and taps. • Tiling to match sanitaryware with a choice (where build programme allows). • Turfing to front garden. Close boarded privacy fencing and turf in back garden. • External cold tap fitted as standard. • Video entry phone system to all apartments. • Mains operated smoke detectors with battery back-up. • Security locks to windows. • Mortice locks to all external doors. • Restraint chain to front door. • Street lighting to parking area. • Telephone points to lounge, bedroom one and bedroom three. • Wiring for satellite system to lounge, and bedroom one (cabling to extend). • Downlighters in kitchen, hall, bathroom and en-suite. • Electric shaver socket to bathroom and en-suite. • Extractor fan to bathroom, en suite. • Concealed pelmet lighting to kitchen. • Ample power and light points throughout. • 5 amp lighting to lounge and bedrooms. • Wiring for TV and satellite to lounge, and master bedroom. (cabling installed not connected). Please note: Specific elevational colours, treatments and details may vary from those depicted in this brochure and all dimensions are approximate. Floor plans, maps and site plans are not to scale. Kitchens, bathrooms and en-suites are indicative layouts only, see Development Sales Manager for final layout.Bishops Ltd. reserves the right to alter specifications without prior notification. While these particulars are prepared with all due care for the convenience of intending purchasers, the information herein is intended as a preliminary guide only. The right is expressly reserved by the Company to amend or vary same and therefore nothing herein contained shall constitute or form part of any contract.